Here is the beginning picture of the bathroom so you know where we began. The vanity and shower were removed and then the wall came up right there left to right. You can tell what I mean if you look at the floor register. The picture you see down below now is actually the laundry room. So last I left you I had just built a floating wood vanity and a mirror to match out of 2 x 4’s. Well next up is a board & batten wall. The left wall when you first walked in seemed rather long and needed a little dimension to it. There are hundreds of board & batten tutorials out there so I am not going to take the time to type it all up. I will tell you I wasn’t trying to save money on this project, but rather just get it done, so I purchased pre-primed MDF. That is definitely not the cheapest way to do it, but at this point in the project it is all about completion. It only took me about an hour to cut and hang all the boards. I used all 1 x 4 pre-primed MDF boards. Then I had to caulk and spackle everything which took another hour. However, if you do caulk and spackle the wall looks very seamless. Next I used my favorite paint sprayer and some painter’s tape with film to tape everything off and then I painted everything two coats of Benjamin Moore White Dove. After everything was dry I installed for of these pretty satin nickel Grayson knobs from D. Lawless Hardware. 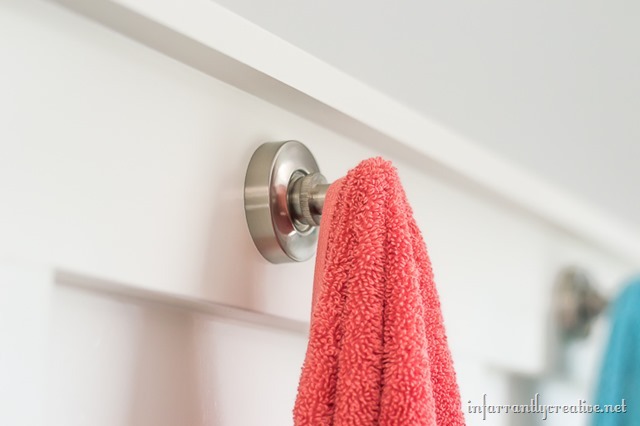 I love the bright colored towels that add a little POP to the neutral space. And here is another glance at the bathroom. Over the toilet I made some floating wood shelves with Minwax Dark Walnut Stain. They are super easy to make and allow me to have a little more storage and decor. Stay tuned with the shower and the final reveal!